How do I add ALT tags to my images? For SEO purposes, ALT tags are basically the text that search engines use to recognize, and rank your store's images. A question we get often is in regards to adding and editing ALT tags for product images. Fortunately, your 3dcart store automatically provides ALT tags for your product images as they are assigned in the store. When you assign images to your products, the 3dcart software will take the product name itself and use it for the Alt Tag text. 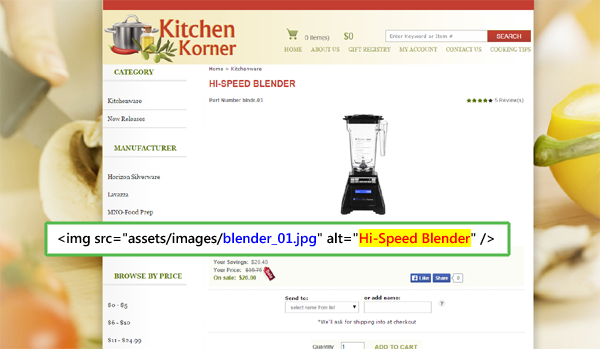 In the example below, we show the image as it appears on the listing page along with the HTML created for the image reference. Note how the ALT tag is reflecting the product's name. will use the store name variable (Settings ->General ->Store Settings | "Store" tab ) for its ALT tag. icon will use the "Free Shipping" variable found in Store Language as well.